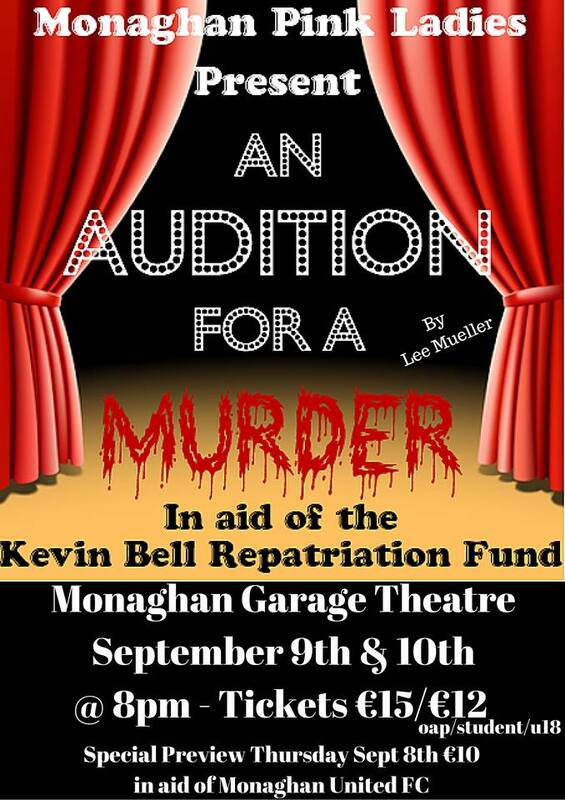 At the Garage Theatre in Monaghan Ireland, not to be confused with Monaghan somewhere else, the Monaghan Pink Ladies will be presenting "An Audition For A Murder" on Sept 29th and 30th. Cast Member Julie-Ann sent a message to me letting me know the Pink Ladies do a play every year to raise money for charity. This is their 3rd year.
" This year our chosen charity is a group that helps Irish families to repatriate their loved ones who die abroad. In our small town we have had a few families who have had to avail of this service and last year when the Irish students got killed in the California balcony collapse, the Kevin Bell Repatriation fund really helped with all the costs and red tape." It's always nice to hear from groups that your play went over well and the audiences loved it. It's even better to hear that your work is being used to help in a worthy manner or cause.